What a wonderful weekend I had at Weekend Memories! It was great hanging out and catching up with old friends and fun getting to know new ones. I always enjoy walking around and seeing what everyone is working on. People are so talented. Years ago when I'd come home from crops my son would ask, "How many pages did you make?" Just thinking about that makes me chuckle. Now he says, "Did you have a good time?" This always warms my heart. I am thankful that over the years he has learned that it's not about the quantity of what you create while you're at a crop, it's about the quality of the time that you get to spend with people that have the same passion that you have for creating. Priceless. So, you probably want to know what I created, right? That's not so easy to explain because I created a lot of elements. 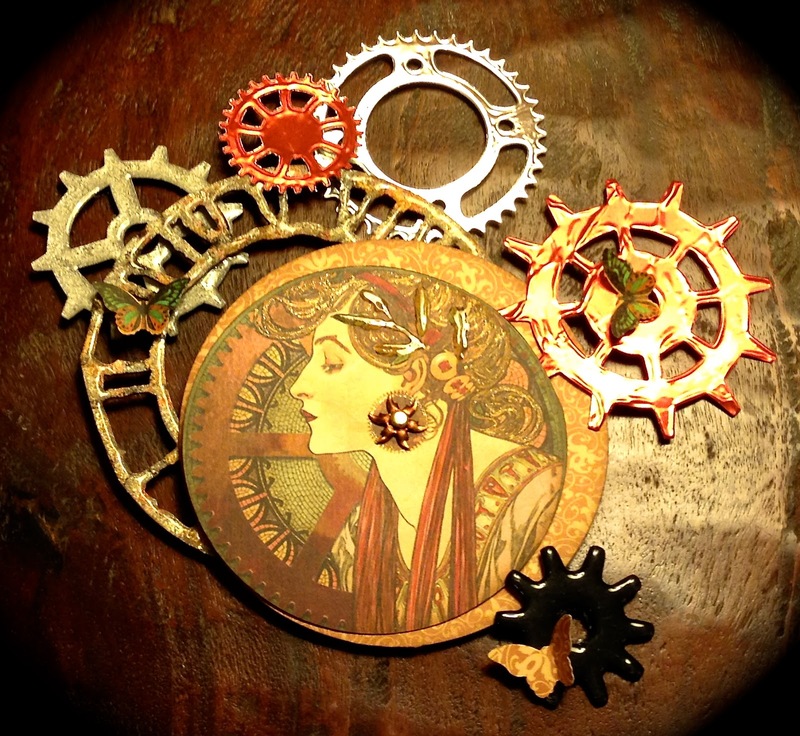 These elements (and a lot of other things) will be put together to create a Steampunk themed mini album. Doesn't this look cool?! I cut chipboard from packaging using the Tim Holtz Weathered Clock die, then used Distress Inks and Distress Stains before using UTEE to emboss.